Seneca Knoll: Minutes from 2 wine trails with lake access. Create the perfect getaway to wine country by staying at Seneca Knoll. This home is only minutes from both the Seneca and Cayuga Lake Wine Trails, making it a breeze to find new favorite vintages in an award-winning wine region. The area also has the fastest growing craft beer trail, featured throughout the Finger Lakes. Looking for new dining experiences? Geneva is just 15 minutes away with some of the trendiest spots for foodies to visit including FLX Table, Kindred Fare, and Ports' Cafe! 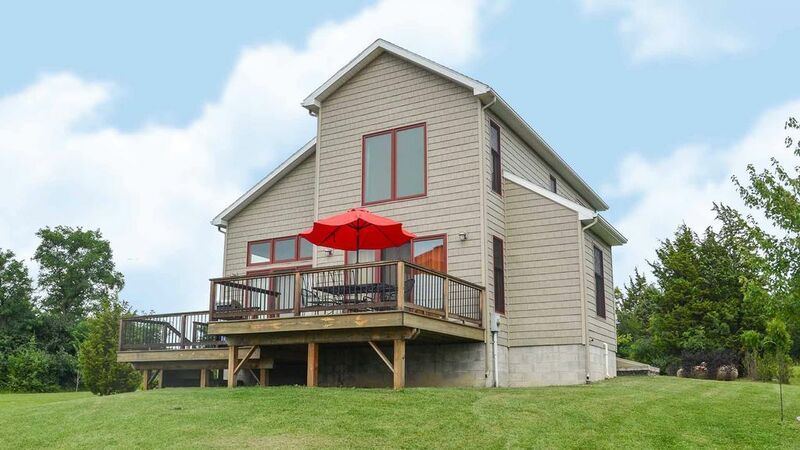 Take the virtual tour of this gorgeous custom built home with Seneca Lake views and easy access to shared residential lakefront. Off street parking leads to the covered porch and main entry in the rear. Vaulted ceilings, stone tile floors, teardrop lights, and bright decor greet you at the entrance. The great room offers seating for six in the living room, with a large flat screen TV with cable and internet access. The dining area overlooks the lake and offers direct access to the spacious two level deck on the front of the home. A contemporary style kitchen features new appliances, wine fridge, small seating area for breakfast coffee, and sliding doors that lead out to the deck. The laundry room is just off the kitchen and features a high efficiency washer and dryer. Just off the great room lies a small hall, with beautifully appointed half bath, master bedroom with queen bed, and a delightful en suite bathroom with an attractive tile shower and separate garden tub. Both the bedroom and the bathroom have a lake view through the south facing windows. The second floor features two nicely appointed bedrooms with queen beds, and another full bath with shower/tub combo. The deck overlooks Seneca Lake and is a great location for BBQs and outdoor dining or lounging. The slightly sloping yard is a good spot for children to play, and the lake access is just 2 doors south of the house. completely at home from the minute we arrived. The house was pristine & even I a self acknowledged clean freak was impressed. The whole house is so warm & welcoming, and has everything you need to make your stay comfortable. I would happily stay here again.